SUMMARY: Away at War is a companion novel to my last book, My Dear Wife and Children: Civil War Letters from a 2nd Minnesota Volunteer, the annotated collection of 100 letters sent by my great-great-grandfather back to his young family on the Minnesota prairie from September 1861 to September 1863. 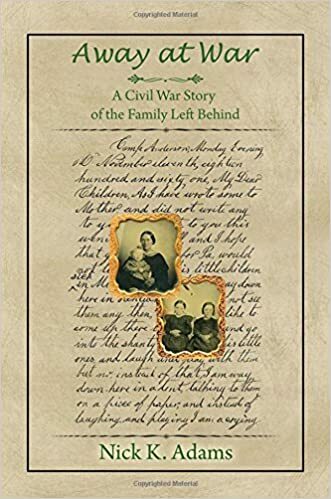 This new book is the story of that family – his wife, two daughters 5 and 7, and an infant son – as they struggled to maintain the homestead until his promised return. The storyline comes directly from the soldier’s letters, for he responded to their farming problems and questions, their descriptions of daily activities and events, and their longing for his safe return. All that information became the basis for the scenes and letters I created to portray what life was like during the same two-year period of the letters, for The Family Left Behind. Minnesota’s harsh seasons dictated the cycles they had to follow, and even with the help of family and friends, the hardships and responsibilities were almost beyond them. THE BACK STORY: After publishing the battlefront story of war in My Dear Wife and Children, I felt compelled to tell the other side of the story: the struggle for survival on the home front. It seemed to me that the family’s heroism in the face of abandonment was every bit as real as the soldier’s in his confrontation with the Rebels. Since the family’s letters were not preserved, I began lifting out of the father’s letters everything he wrote in response to his wife’s and daughters’ communications of problems, accomplishments, activities, visits, fears, and joys. My own homesteading experiences provided much of the background information, augmented by numerous books and articles about mid-nineteenth century farming practices and an early history of Fillmore County. Two years were required to produce the first draft and major re-write before presenting the manuscript to an editor for final polishing. WHY WOULD SOMEONE WANT TO READ IT? : While the stories of and from Civil War battlefields are often written and studied, not much has been published about the war’s personal effects on the families who were at least temporarily separated from the men who went to fight, either to preserve or divide the Union. Those already interested in the Civil War may find the insights presented in this story rewarding, while young readers, looking for additional Little House on the Prairie style literature, may find it quite engaging. REVIEW COMMENTS: In Away at War the reader is introduced to the other side of war, the terrible impact, the pain and anxiety, and the untold suffering it causes family members who are left behind. This novel explores the life of a family without their hero, exploring a far greater conflict than what readers get in general fiction…a moving chronicle of the experience of war, a compelling story with relevant historical references, a vivid picture of what life feels like without someone who’s at the front. Very strong themes, including family, loyalty, war, and suffering. A well-crafted story that will entertain and inform readers. It reads like a real piece of history! This book helped to awaken an interest in me about the Civil War… Nick K. Adams did a spectacular job in keeping the book historically true, while still making the story interesting with fictional elements. I finished this book with a greater understanding of the pain, suffering, and independence the Civil War evoked in the families who had soldiers who went to war. There were times when I found myself shedding tears in sympathy and other times that I marveled at the strength of the family. Overall, this was an emotional book for me that I greatly enjoyed reading. Readers Favorite Book Reviews. AUTHOR PROFILE: Nick K. Adams grew up in Los Angeles County and now lives in Lakewood, WA. After retiring from a career in elementary education, he continues to speak at schools, libraries, service clubs, and Civil War Round Tables. He is also an avid Civil War re-enactor, as it was his great-great-grandfather who wrote the letters as he fought to preserve the Union. His previous books are: The Uncivil War: Battle in the Classroom, and My Dear Wife and Children: Civil War Letters from a 2nd Minnesota Volunteer. SAMPLE CHAPTER: You are invited to the author’s website (www.Civil-War-Letters.com) where you are able to read Chapter One. LOCAL OUTLETS: Independent bookstores can order Away at War for you (POD) through Ingrams or other major distributors. WHERE ELSE TO BUY IT: Away at War is already available at Amazon and Barnes & Noble Bookstores, and should soon be offered at the Fort Snelling Bookstore (St. Paul, MN), Minnesota Historical Society (Minneapolis, MN), and the Chickamauga National Battlefield Bookstore (Ft. Oglethorpe, GA).